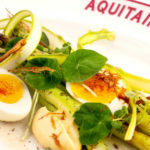 One of Boston’s most successful chef/restaurateurs, Seth Woods is the Executive Chef-Owner of the Aquitaine Group–which includes the critically acclaimed Aquitaine – Bar á Vin Bistrot, Gaslight, Metropolis Café and Cinquecento in the South End, as well as Gaslight Lynnfield, Aquitaine Chestnut Hill and Aquitaine Dedham further afield. What sets Woods apart is his possession of both the business and creative restaurant acumen. A graduate of the Culinary Institute of America, he began working in restaurants when he was a teenager. After a short stint on Wall Street, Woods switched gears to the fast-paced dining scene in New York City. Ever since, he’s brought business sense and culinary expertise to each of his ventures. Arriving in Boston in 1993, Woods opened Alloro restaurant in the North End. He went on to serve as Executive Chef at Armani Café. He then opened his own restaurant, Metropolis Café in April 1995 followed by Aquitaine Bar á Vin Bistrot in 1998 and Aquitaine Chestnut Hill in 2000. The restaurants have received praise from local and national publications including The New York Times and Food & Wine magazine. Biking through Europe annually for inspiration, Woods remains committed to providing his clients with the highest quality dining experience at an affordable price.